FREE entrance for the public! Lectures topics ranging from kindergarten to college entry, an exhibitor hall, a book and curriculum sale, prizes, and MORE! 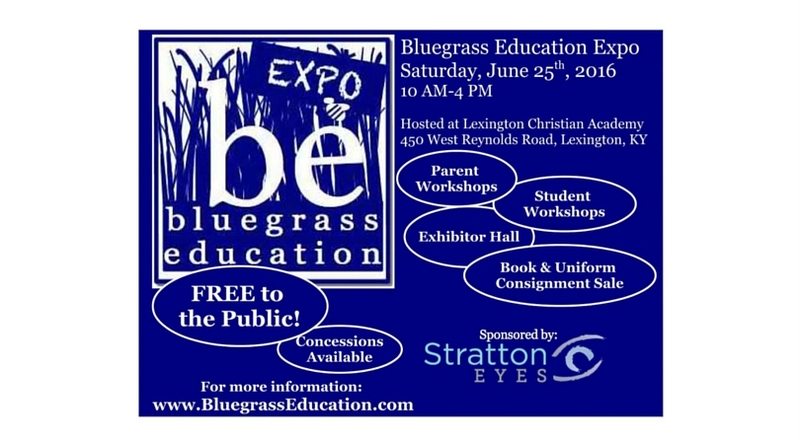 Come to the Bluegrass Education Expo to discover your options! 1. B.E.E Lecture Series— featuring informative breakout sessions from public schools, private schools, homeschool co-ops, as well as extracurricular groups throughout the area. See below for the full list. 2. B.E.E. Student Workshops— Breakout sessions for students from popular extracurricular groups like Kentucky Youth Leadership, Bricks 4 Kids, Awesome Inc., and Bluegrass Community & Technical School! 3. B.E.E. Book & Curriculum Consignment Sale–the B.E.E. Book Sale is offered to assist parents in the buying and selling of uniforms, curriculum, and educational material. 4. “Meet the Co-op”–a meeting ground for parents and prospective homeschool co-ops. Tentatively scheduled for 1 PM. If you are a homeschool co-op and you would like more information, please contact us directly at bluegrasseducation@gmail.com. 5. “Meet the Tutor”–a meeting ground for parents and prospective tutors. Tentatively scheduled for 2 PM. If you are a tutor and you would like more information, please contact us directly at bluegrasseducation@gmail.com. If your business is interested in sponsoring this year’s event, please e-mail us directly at BluegrassEducation@gmail.com. The 2015 Expo helped raise $1500 for local and international non-profits as well as generating over 300 books for donation to the International Book Project! Please take a moment to thank our sponsor, Stratton Eyes for making our event possible! Join us for a mini-session puzzler featuring BreakoutEDU where your student attempts to crack the codes, survive the trials, and escape before the buzzer sounds. Parents are invited to join in the fun and play too! Can you work together to solve the puzzle? Are you willing to follow your student, or will you jump in to lead? Kentucky Youth Leadership is a local non-profit focused on student leadership training culminating with international travel. Awesome Inc U exists to help people learn to code and unlock the power to create their own Mobile Apps, Websites, and Video Games. Start your journey with our classes in downtown Lexington, no prior programming experience necessary. Come join the hundreds of kids and adults who are learning to harness the power of software. Energy is essential to almost everything we do, from the lights in our homes and classrooms to the gasoline that fuels our cars. This workshop will introduce students to the world of energy in all its amazing forms. We will explore many sources of energy from wind and solar power to biofuel and fossil fuel. Students will define terms like renewable, landfill, greenhouse effect and generator and use LEGO® Bricks to build moving models of just some of the awesome ways we power our world. Bricks 4 Kidz classes provide an extraordinary atmosphere for children ages 3-13+, where we learn, we build, we play with LEGO® Bricks. Our programs are built around proprietary model plans, designed by engineers and architects to provide the building blocks for the Bricks 4 Kidz approach to educational play. Restricted to 12 per class. We will be offering a 1 hour tutorial on how to build, program, and run robots. The participants will be introduced to the different sensors that can be attached to our robots in order to perform a variety of tasks. Students will also be able to participate in a small challenge course at the end of the session.